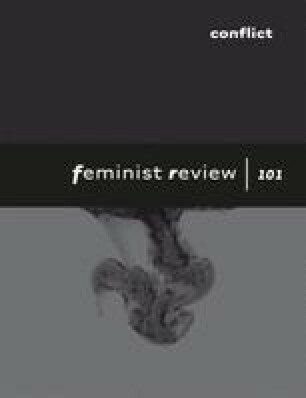 It's Sunday morning and I’m in bed reading Melissa Gregg's book Work's Intimacy, while scanning previous book reviews on the Feminist Review website on my iPhone, having just ‘liked’ the journal on Facebook. My activities are interspersed by incoming emails from students experiencing weekend freak-outs about their course work assignments and from my sister outlining the family plans for Christmas Day. I’ve a bunch of friends coming round for lunch, an online Skype editorial meeting this evening and no time during the week to do any more work on this. Hence, I’m a little under pressure to make headway in writing my review. My head's still somewhat fuzzy from a book launch and after-party last night. But with a good dose of coffee, I’m on the case, surrounded by my various communications gadgets, with my laptop, pens and paper sprawled across the duvet. ‘Presence Bleed’ is how Gregg describes my Sunday morning state of being. This is an apt term that cuts to the heart of what's at stake in post-Fordism's blurring of the so-called work/life boundary, that is, ‘the familiar experience whereby the location and time of work become secondary considerations [when] faced with a “to do list” that seems forever out of control’ (p. 2). Gregg provides a compelling account of how the compulsion to work is everywhere, infusing all aspects of our lives through online technologies that mean we carry our offices around with us, literally, everywhere we go and everywhere we are. Weaving a detailed ethnographic narrative with astute theoretical analysis based on interviews with employees in the information, communication and education (ICE) professions and in finance, insurance and real estate (FIRE), Gregg's analysis may not be quite as apocalyptic as Robert Frost's 1923 poem ‘Fire and Ice’ about the end of the world. However, the reader is certainly left with a sense of urgency as to whether the omnipresence of the contemporary office that Gregg describes can lead us anywhere more affirmative than an insidious communication grind that breeds stress, anxiety and exhaustion. The coping strategies and experiences of the male and female ‘professionals’ interviewed in Gregg's book point to the ways that these much celebrated online technologies have not brought liberation in as much as they have fostered speed-up and alienation in the way they have enabled us to be put to work more with less. Gregg brings to our attention how online technologies place us in a schizophrenic condition where we either simulate presence or feign remoteness. We are constantly managing our performance of work as a demand placed on us for a ‘consciousness of the always-present’ (p. 3) that is constantly anticipating action and response. According to Gregg, this is a form of affective labour in which we find ways to hold on to our sanity, that is, retain a feeling of control in an environment that obfuscates the structural insecurities of contemporary labour. In the face of the ever-looming existential vulnerabilities of our exposed and precarious present, this is a context in which the ability to get things done is coded as personal achievement and the inability to do so as personal failure. In her analysis of the knowledge worker's need to manage her own (and others’) emotions, Gregg builds on existing feminist interpretations of the emotional labour of service work to observe that ‘while the service worker seeks to control outwardly directed emotions for business profit, the knowledge worker's affective labour operates in the opposite direction […] devoted to developing reserves of emotional resilience to withstand the ontological challenges of the typical working day’ (p. 11). Emotion management is thus a resource with which to cope in as much as it lubricates the cogs of cognitive capitalism's machinery. Gregg also makes vivid the quagmires of the contemporary organisation of knowledge work, quagmires that feminism is all too familiar with. She highlights how it is precisely the possibilities of organising work against a backdrop of the conflicting demands of reproductive labour that have enabled positive openings for female employees. Women can now sit down in front of the computer once the kids have gone to bed. Moreover, Gregg draws attention to the pleasures and intimacies, the sense of accomplishment and meaning, that we gain from our work. A feminist analysis is well aware of the minefield of the ‘work of love’ (cf. Dalla Costa, 2008), a framework used to bring into focus the copious amounts of reproductive care work made invisible as work not only because it often goes unpaid, but also because it is not coded as work – we do it because we care and because we want to. Furthermore, feminism has also helped us understand that it is not always so easy to distinguish the realms of work from the realms of family or friendship, where capitalism instrumentalises our most intimate relationships (cf. Morini, 2007). Overall, Gregg's message is clear: we need to find ways to push back against work's colonisation of our lives and we need to deal with how intimacy is both overcoded and exploited by corporate interests. At the same time, the author rightly poses the intimate relationship we have with our work as the very barrier to overcoming the problems she identifies. In detailing the manifold experiences of work and the different (gendered) coping strategies we deploy to manage the competing demands on our time and energy, Gregg provides us with an in-depth analysis of the complexities of work's intimacy that adds another much-needed layer to our understanding of work. With rigour and with empathy, she lays out for us the day-to-day uses and abuses of online technology in the context of their political economy. At the same time, Gregg is neither blinkered nor apologetic in analysing the problems with what are often seen as still very privileged middle-class jobs. Her contribution rises above that pitfall in the way that acknowledges it as an issue. For Gregg, it seems that what is ultimately at stake is our intimacy and how to claw it back from capital's enclosure. However, as Gregg's analysis quite rightly makes apparent, the struggle is not only against the disaffections our current work lives produce. The struggle is also against the imposition of unnecessary work, that is, work that is not needed for the reproduction of our livelihoods. It is precisely here that a feminist analysis of labour has much to offer in posing the terms of such a debate beyond a critique of alienation, terms that enable Gregg's timely and important book to be situated within the stratifications of class she is conscious of, that is, the global division of labour in its gendered (and racialised) dimensions that capital continues to depend upon.